Cantor Hinda Eisen Labovitz is the Cantor/Educator at Ohr Kodesh Congregation in Chevy Chase, Maryland, where she has served since June 2014. She achieved ordination and a masters degree in Judaic studies at Hebrew College in Newton, MA in June of 2014. She is the two-time recipient of the Al Goldberg Scholarship in Jewish Music, and the 2013-2014 recipient of the Gideon Klein Scholarship from Northeastern University, for which she dedicated a year of independent study of the Westerbork Cabaret. Upon graduation, she also received the Israel Pollack Award for Excellence in Judaic Studies from Hebrew College. 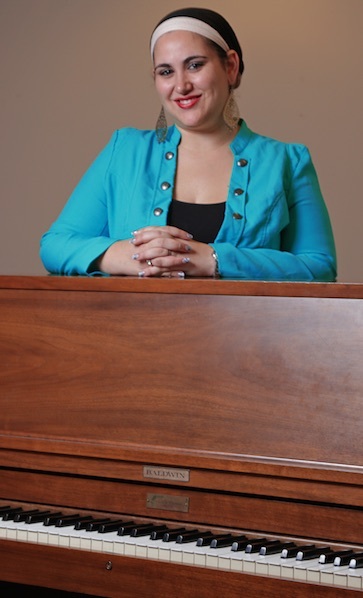 Cantor Labovitz served as part-time ba’alat tefilah and tutor at Congregation Kehillath Israel in Brookline, MA, and as the assistant to the conductor for the Zamir Chorale of Boston, where she has been Mary Wolfman Epstein Conducting Fellow (2008-2009) and proud alto in Zamir from 2006-2014. Hinda is also served as Vocal Coach for the 8th grade play, Aladdin, at Solomon Schechter in Boston. Cantor Labovitz served as Youth and Community Educator at Temple Aliyah in Needham, MA in 2012-2013, and as the Ritual Director at Temple Emanu-El in Providence, RI from 2009-2012, after graduating with a B.A. in Religion with a concentration in Special Education from Boston University in 2009. Hinda attended and worked at Ramah camps in the Berkshires, Wisconsin, and New England. As she collects, translates, writes, and is inspired by new and ancient prayers, she publishes them on http://tekhines.wordpress.com/. Barbara and I enjoyed your Cantor Concert at Leisure World on Thursday. Our Hebrew is very poor but we enjoyed the emotional Jewish songs nonetheless……..